53 years, 8 months, 2 days old age. 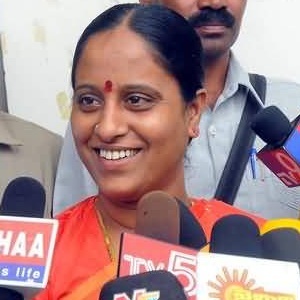 Konda Surekha will turn 54 on 19 August, 2019. Only 3 months, 28 days, 7 hours, 57 minutes has left for her next birthday. Konda Surekha has celebrated the total number of 53 birthdays till date. See the analysis by days count and bar graph. Konda Surekha was born on 19th August 1965 in Warangal, Andhra Pradesh. She is an Indian Politician and a former Telangana Rashtra Samithi politician, MLA from Warangal constituency, Andhra Pradesh then ( Now Telangana). Konda Surekha entered politics after she was elected as Mandal Parishad, in 1995. In 1996 she was chosen as PCC member. After seeing her popularity her party decided to award her ticket for 1999 Assembly elections. Thus she was elected as M.L.A from Shayampet. She won back to back elections. After getting elected in 1999, she was re-elected in 2004 from the same constituency. In 2009 she fought from Parkal Constituency and won with a thumping victory and was immediately introduced into YSR’s bigger scheme of things and was awarded the post of Minister for Women Development and Child Welfare. Konda was employed as Minister for Disabled & Juvenile Welfare and Women Development & Child Welfare, in Y. S. Rajasekhara Reddy’s reign, but stepped down from her post after YSR’s death when his son Y. S. Jaganmohan Reddy was not named Chief Minister, even though he was a senior man and also had a larger number of MLAs support. She was born to Thumma Chandra Mouli and Thumma Radha. She tied the knot with Konda Murali, who is also a noted politician. The couple is blessed with a daughter.